King of controversy Salman Khan is in trouble yet again. 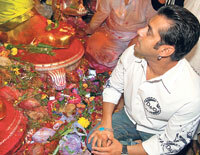 A Muslim organisation has issued a fatwa against Salman for attending a Ganesh puja. Bollywood star Salman Khan is once again in trouble following issuance of a fatwa by Ifta-Manzar-e-Islam of Bareilly against idol worship. The barely-based Daarul-Ifta-Manjar-e-Islam has acted against Salman after the actor took part in the Ganesh Puja celebrations in Mumbai. The organisation said unless Salman reads the Kalmas all over again, he would not be considered a Muslim. The order was issued as Islam prohibits all kinds of idol worship. Salman, who had just been out of jail in the Chinkara poaching case, celebrated Ganesh mahostav with his family on Monday. The Khan family had brought home Ganesh idol for one and a half days. Salman matched steps with his step mom Helen with his nephew on his shoulders. The actor went out dancing during the procession before immersing the Ganesh Idol into the sea. The fatwa was sought by Maulana Adnan Raza Kadri of All India Raza Action Committee. On Sunday last, media reports said that Salman Khan and his family members worshipped the idol of Lord Ganesh and danced during the immersion of the idol. Bareilly: Darul Ifta of Manzar-e-Islam clarified that widely reported fatwa on Bollywood actor Salman Khan was not specifically against him. Today mufti of Manzar-e-Islam clarified that they were asked their opinion about Muslims who worship idols and participates in idol worshipping processions, nowhere Salman Khan or his recent act was mentioned. The rule of Islam regarding idol worshipping is quite clear and this act is considered non-Islamic therefore any Muslim involved in worshipping anyone besides Allah need to recite Kalma again.